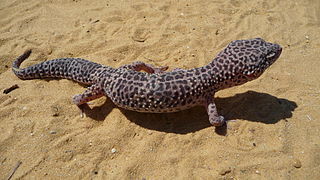 GigaDB Dataset - DOI 10.5524/100246 - Supporting data for "Draft genome of the leopard gecko, Eublepharis macularius"
Supporting data for "Draft genome of the leopard gecko, Eublepharis macularius"
Geckos are among the most species-rich reptile groups and the sister clade to all other lizards and snakes. Geckos possess a suite of distinctive characteristics, including: adhesive digits; nocturnal activity; hard, calcareous eggshells; and lack of eyelids. However, one gecko clade, the Eublepharidae, seems to be the exception to most of these “rules” and lack adhesive toe pads, have eyelids, and lay eggs with soft, leathery eggshells. These differences make eublepharids an important component of any investigation into the underlying genomic innovations contributing to the distinctive phenotypes in “typical” geckos. We report the high-depth genome sequencing, assembly, and annotation for a male leopard gecko, Eublepharis macularius (Eublepharidae). Illumina sequence data were generated from seven insert libraries (ranging from 170 bp to 20 kb), representing a raw sequencing depth of 136X from 303 GB of data; reduced to 84X and 187 Gb after filtering. The assembled genome size was 2.02 Gb, close to the 2.23 Gb estimated by k-mer analysis. Scaffold and contig N50 sizes were 664 kb and 20 kb, respectively, comparable to the previously published Gekko japonicus genome. Repetitive elements made up 42% of the genome. Gene annotation yielded 24,755 protein-coding genes, of which 93% were functionally annotated. CEGMA and BUSCO assessment showed that our assembly captured 91% (225 of 248) of eukaryotic core genes and 76% of the vertebrate universal single-copy orthologs. The leopard gecko genome assembly provides a valuable resource for future comparative genomic studies of geckos and other squamate reptiles. Displaying 1-10 of 33 File(s).